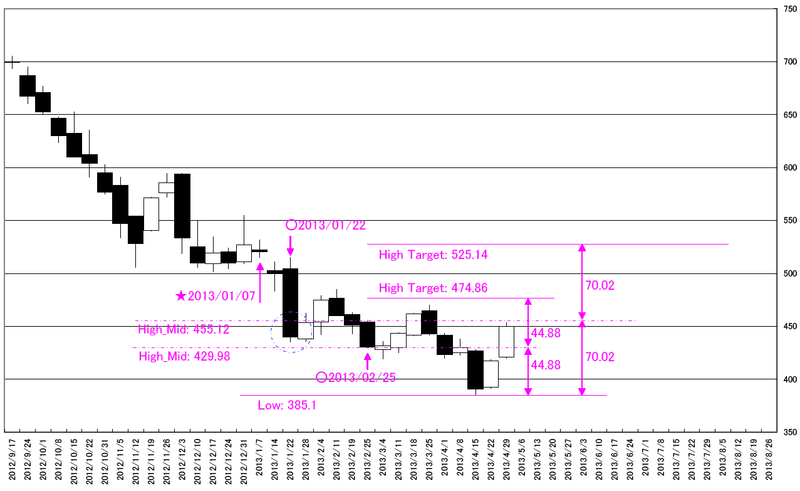 Apple Inc. (AAPL) Weekly; 07/15/2013 week will be “HENKABI”; Automated “HEKABI” extract algorism. 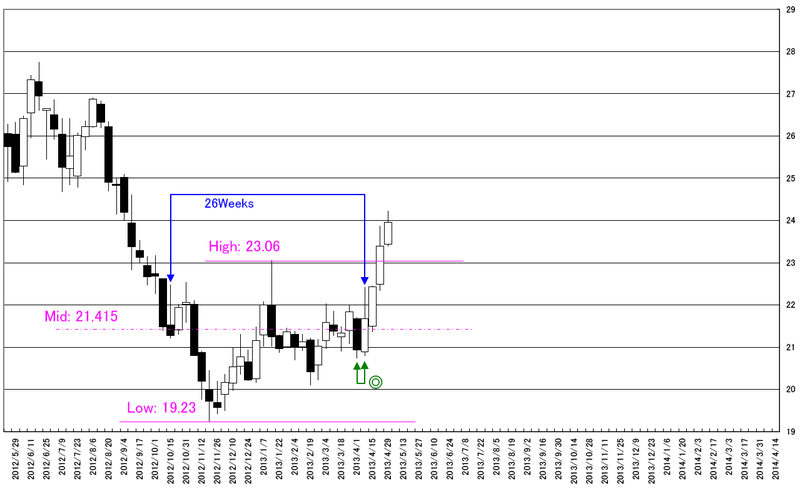 Today’s analyze is about Apple Inc. (AAPL) (Weekly Data). We deal the brand-new Apple Inc. (AAPL). We back to the past (01/07/2013) and analyze. 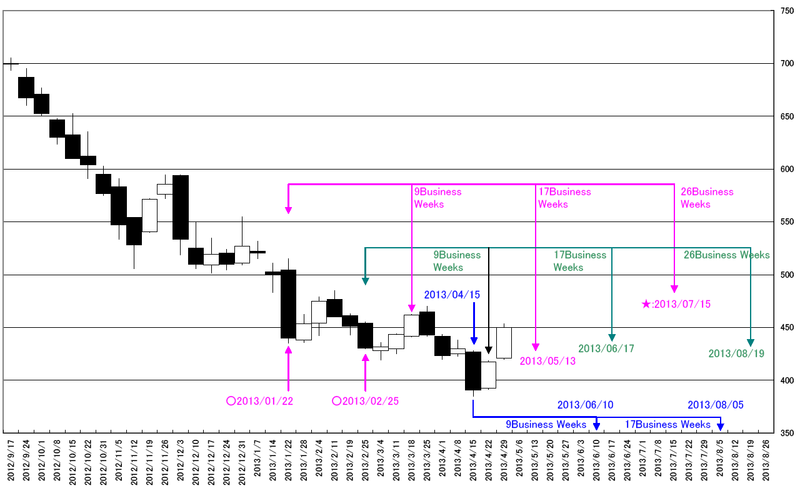 02/25/2013 week is “HENKABI” point using our latest algorism. This is not our regular watching brand. The main future scenario is the market price will stop dropping and will be the steadiness and will rise or fall again. This first is finding basis point. We think 02/26/2013 week is not the obvious reversal point; this week’s high, low or close price will be the half price relation. The last week high price has resisted by this half price. 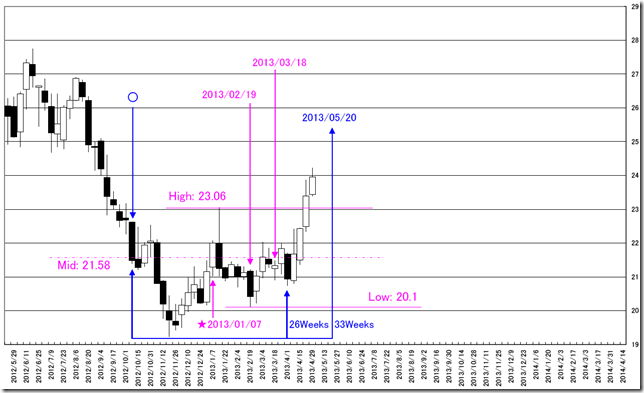 The conclusion is 2013/01/22 week is basis point. And the resistance point is 474.86 ad 525.14 point. 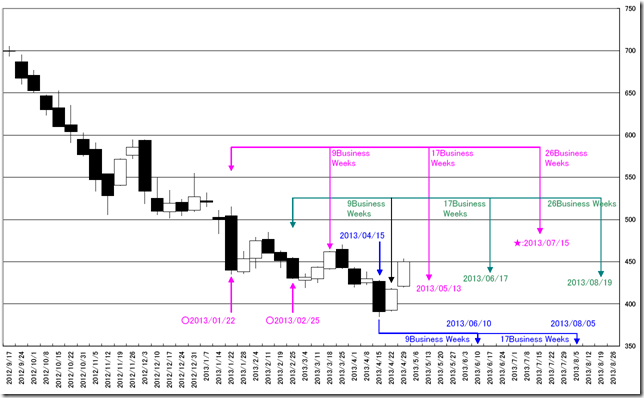 Using last week data and we can conclude 07/15/2013 week will be the “HENKABI” week. This point is the 26 business weeks from 01/22/2013 week. 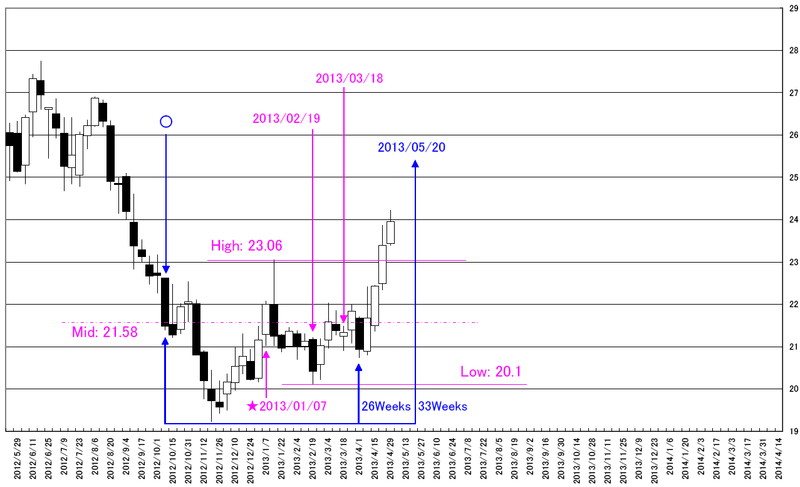 And 17 business weeks from 01/22/2013 week is 05/13/2013 week and this week will also be the “HENKABI” point. 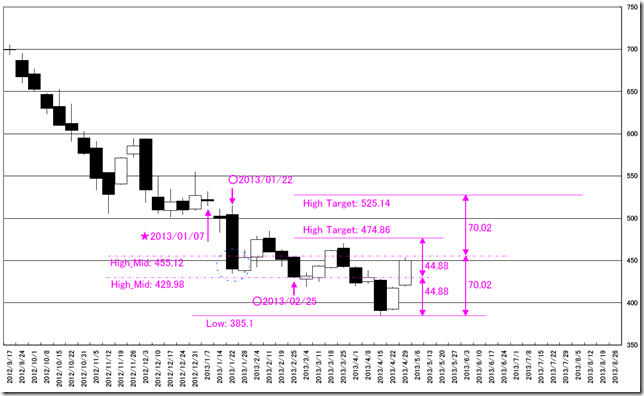 Intel Corporation (INTC) Weekly; 05/20/2013 week will be “HENKABI”; Automated “HEKABI” extract algorism. 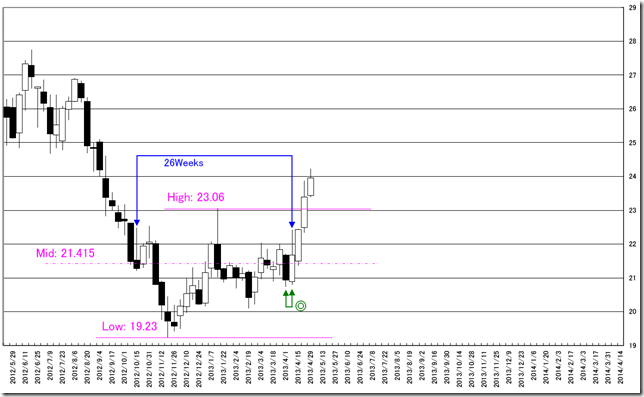 Today’s analyze is about Intel Corporation (INTC) (Weekly Data). We deal the brand-new Intel Corporation (INTC). This new algorism can take the proper half price relation. This algorism points out the year low. We need to consider the highest and the lowest point and we can reach circle point. And the point of the last dip was 26 business weeks from the circle point. The half price of the lowest and the highest point is next week and this is basis point. And double circle point is “HENKABI” weeks. The next “HENKABI” week is 05/20/2013 week. This week is the 26 business weeks from the lowest and 33 business weeks from the steadiness starting point.